Staging allows potential buyers to envision the house as a real home. 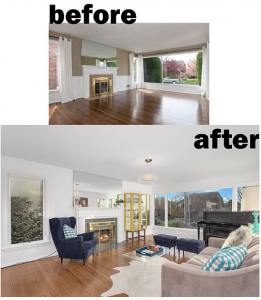 Many people may need help imagining the full potential of a house to look its best, and staging done right can really achieve this. It allows the buyer to focus on the best architectural features of the house while turning its flaws into positives. 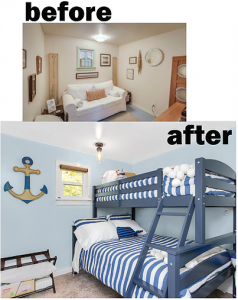 One common misconception of staging is that it is decorating. It is not. Decorating is when your home reflects your personal taste and lifestyle. Staging is done to appeal to a broad range of buyers, to reflect lifestyle trends in your market and to accentuate the unique features of the home. 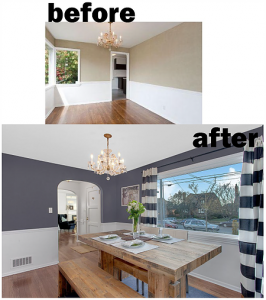 Staging can make a dated home look current and save you money on remodeling. According to the National Association of Realtors’ (NAR) “2015 Profile of Home Staging”, buyers’ realtors reported that 81% of their clients agreed with this. In a competitive market, it is so important for your house to stand out. A stager can help with your online listing, specifically through professional photos. It’s like sending out your resume for a job application. How can you make your home look its most attractive online? With about 92% of buyers using the internet to search for houses, this is truly a critical step in the selling process. 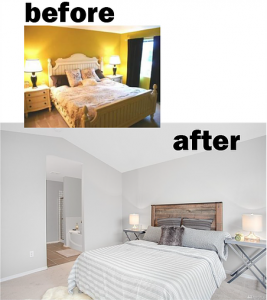 Staging gets your house sold faster. The Real Estate Staging Association’s (RESA) “Consumers Guide to Real Estate Staging” reports that homes that had not been staged before listing sat on the market for an average of 143 days. Once these homes were staged, they sold an average of 40 days. Moreover, homes that were staged pre-listing averaged 23 days on the market. Staging works. 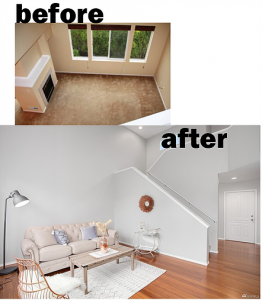 Staging can increase the final sale price of your house. According to the NAR report, 52% of buyers’ realtors believe that buyers offer more for staged homes. In a survey of 3,500 staged homes by Home Staging Resource, 46% sold for 10% more than they would have unstaged. In response to this growing need, Beach & Boulevard now offers staging services! Please check out our website at www.BeachandBlvdStaging.com for more information. Good luck!